Media caption"The secret to long life is to avoid dying" says England's oldest man. 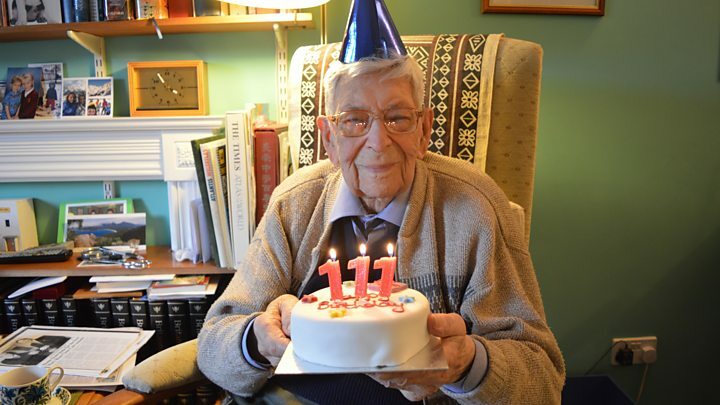 Britain's two oldest men are marking their 111th birthdays. Alf Smith, from St Madoes, Perthshire, and Bob Weighton, from Alton, Hampshire, were both born on 29 March 1908. Mr Weighton, who grew up in Hull, said he had requested not to have a birthday card from the Queen in order to save public funds. The men have never met but have exchanged birthday cards in recent years. It is not known which of them was born first. Mr Weighton is celebrating his birthday by officially launching his new book of poems, to raise funds for elderly people in Alton. He said he asked not to receive a royal birthday card because "I do not see why the state should pay for the Queen to send out all these things. It's not a personal thing". The former teacher and engineer has two sons and a daughter, 10 grandchildren and 25 great-grandchildren. He said the world had changed "enormously" in his lifetime but people had mostly stayed the same. "The basic concerns of human beings [are] exactly the same - 'can this person be trusted?'" he added. He said Brexit was "a total mess", following Britain's failure to leave the European Union on his birthday. "My own feeling is that if there were defects, and there were quite obviously defects, we can negotiate on the inside rather than walking off the field with the cricket ball and saying 'I'm not playing'." Mr Weighton said the most common question he was asked was about the secret of his longevity. But his only advice on the matter was "to avoid dying", he said. He and Mr Weighton both spent part of their lives in Canada. Asked for the secret of a long and happy life in a previous interview he said: "Porridge is helpful and having a job you enjoy."